After the hearty lunch at Calanthe Art Cafe, we went back to the hotel to check out. On our journey back to the hotel, we dropped by Italy Bakery. Last round, Mamarazzi wanted to try out their famous cake but it was sold out. This round she was lucky. Bought two packs. Bought home. Ate it two days later. It was still soft and nice, A lot of creamy filling in it. Was not too sweet. After we check out of the hotel, we dropped by Tan Kim Hock to get some "hand letters" and their Durian Cendol. Sad...guess, the durian Ice Cream from Payung Cafe really spoilt it for Mamarazzi and me. It just doesn't feel the same with durian paste/syrup instead of real durian pulp. Interesting. Did not noticed this the last round we were at Tan Kim Hock. Hmmm...so this is how Malacca Tree looks like. Mmm....Malacca was named after a tree? Well, we had to say farewell to our dear friends as we headed home. 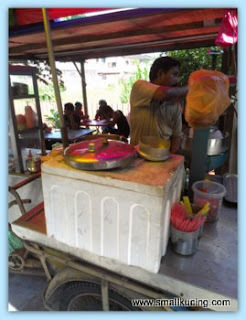 Papa was not satisfied that he did not get to taste the famous Indian Rojak and Cendol at Restaurant Sakina, Bukit Cina. Hence we headed back there to "tapau". Looked and looked but unable to find. Finally spotted the banner. Ohh they had moved across the street. 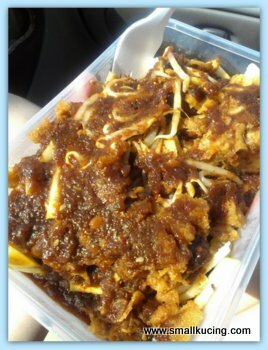 Clever Mamarazzi brought along a container to put the Rojak coz panned to eat in the car. It was just too hot outside and we were rushing against time to get back to Kuala Lumpur before the traffic jam start on the highway. Papa become a baby lor. Gets to be spoon fed while driving. The gravy was not that spicy but Mamarazzi was having sore throat hence felt the sting. The taste of the gravy is different from what we have here in KL. 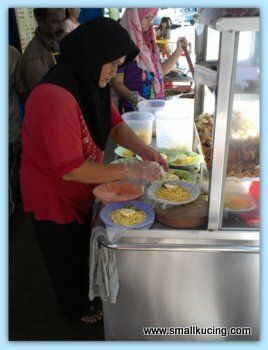 Mamarazzi felt that the rojak had less variety of stuffs compared to here. Could be that Mamarazzi taste buds gone crazy thus unable to taste properly. Nice Cendol just to sooth the throat. while they were having a feast, i was having a feast too in Dreamland. 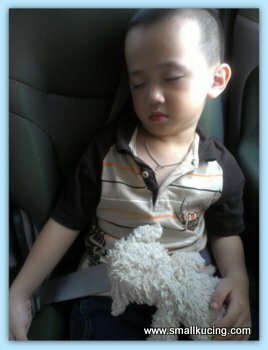 LOL @ I was having a feast too in dream land, he looks so cute while sleeping.. And the Italian cake looks really delicious.. Yaaaaaa!!!! Payung's the best!!! Rojak...that type? Sibu got nice ones too. Didn't know you people would like. But our best - that guy moved to Kuching already. Tsk! Tsk! 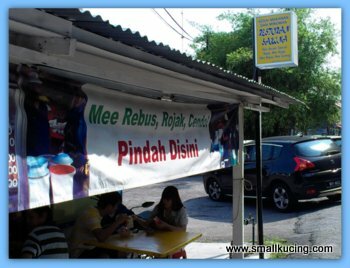 Hi Small Kuching, my grandfather one time used to stay at a place called Pokok Melaka. And I used to cycle here go fishing nearby padi fields. And surprisingly we too have those Tan Kim Hock goodies here. Infact lots of Mallaca stuff sold in stores here, from belachan, chinchaloke to biscuits. Can imagine you all had fun the holidays. I was born in Malacca, studied at Anglo Chinese school till Form 1, ten moved to KL. errr, mamarazzi can i ask a question?? you know why rojak and cendol are always together?? haha.. 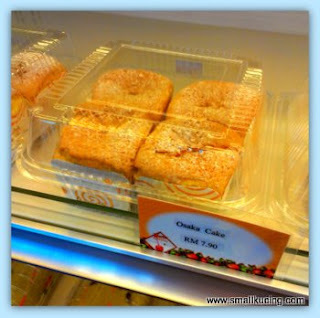 Ya, the Osaka cake is Hokkaido cake here... you can get in RT Pastry in Subang Jaya. 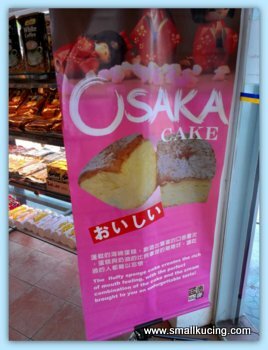 I think it's cheaper than the Osaka one. The bread looks nice & soft! The places that we go & the food we ate seems very different. I didn't see all these stuff. Malacca Tree? wonder how much of truth there is to this theory. 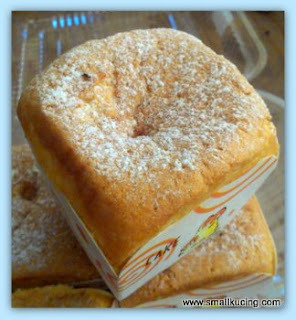 Love the nice spongy bun with the filling. i heard that osaka cake is very famous, but yet to try any..
Gosh..this is really a makan makan trip! !